Consumer marketing trends are always evolving, especially as new technology becomes available. This year has been all about the influencer, but next year we’re likely to see some big changes surrounding augmented reality and artificial intelligence. Take a look at the trends we expect to see in 2018. The latest statistics show that 61 percent of the total mobile audience uses Facebook Messenger and 50 percent use WhatsApp. These mobile messaging apps are changing the way consumers receive content, as well as how they communicate with their favorite brands. In addition to the rise of social messaging, we’ll also see even more chatbots within these platforms, with 67 percent of marketers believing chatbots will soon be more popular than mobile apps. The programs are pretty easy to implement, requiring little to no knowledge of code. The idea is that customers can receive immediate attention for a wide variety of customer service needs, which then increases loyalty as their needs are met. If you don’t know much about chatbots and aren’t sure you want to use artificial intelligence in your marketing efforts, you can still connect with customers through messaging apps. But be prepared to provide immediate assistance whenever possible, because you’ll need to outperform those companies who are using chatbots. The word is out that Apple, the most valuable company in the world, is planning to invest over $1 billion on original content. And both Google and Amazon are not far behind. Curata notes that 75 percent of marketers overall are increasing their investment in content marketing. There is good reason, because there is virtually no marketing without content. It is the starting point for everything. And while it traditionally lives in the “owned” space of the PESO model, increasingly the lines are blurring. And so marketers would be wise to focus on better storytelling, making sure that everything that makes their brand unique is reinforced in their content. Today’s content needs to be entertaining, thought-provoking, immersive and visually stunning to build meaningful relationships with consumers. Video marketing is the “it” girl of the moment, by far the most popular media content type out there. But it appears that audiences are craving even more authenticity. Live stream videos will continue to make an impact and grow in popularity as buyers get that sense of truth and transparency from unedited, raw video that can also provide added entertainment value. The proof is in the numbers, with live streams holding customer attention three times longer than pre-recorded video. Right now, Facebook is tops for live video streaming, but Instagram and Snapchat stories still have a following with Millennial and Gen Z crowds. Don’t be surprised to see more platforms—both existing and new—pop up with live streaming capabilities. The hottest marketing phrase of 2018 will be augmented reality, especially with the iPhone X’s ability to provide AR experiences for users. Several brands have already jumped on board, like IKEA with their Place app, which makes it possible for users to “try on” new furniture in their home before buying. But remember that there is a time and place for AR, and your company may not need it. Don’t spend your entire budget developing augmented reality programs and campaigns if they don’t make sense for your brand. It’s been the hottest marketing trend this year, and we don’t expect it to end once 2018 arrives. Influencer marketing offers the chance to wrap all of the previous trends into one neat, word-of-mouth package, especially in the food and beverage marketing arena. Remember that the best influencers aren’t always celebrities or even internet-famous personalities. Your biggest results will often come from smaller influencers with in-depth knowledge of your brand and industry. These so-called micro influencers are 4x more likely to fuel engagement and have loyal followings within specific niches. They provide authenticity and transparency for your brand; something consumers trust more when it comes from someone that’s not you (or the Kardashians). Engagement is the thread running through all of these marketing trends, and marketers need to understand the right platforms, messages, and experiences to connect their brand with their customers and earn their loyalty. 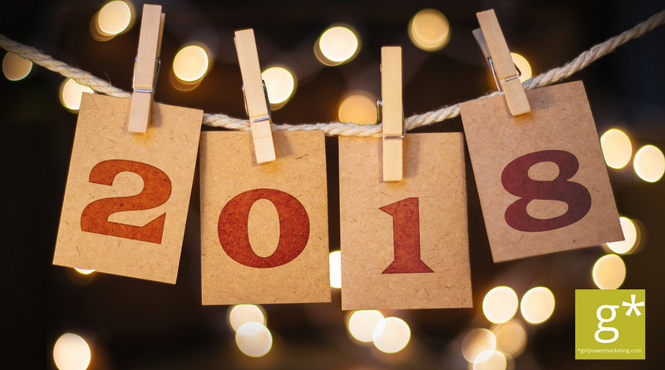 If you’re ready to move into 2018 with the latest marketing trends at the ready, then give us a call. We’re here to help.